The (vegan) cavewoman in me always worries about starvation. I worry there will not be enough food and never leave home without a gazillion snacks. As a health-minded person though, juice cleanses have always been on my radar, but thanks to the aforementioned, I’ve always been a little wary of them. 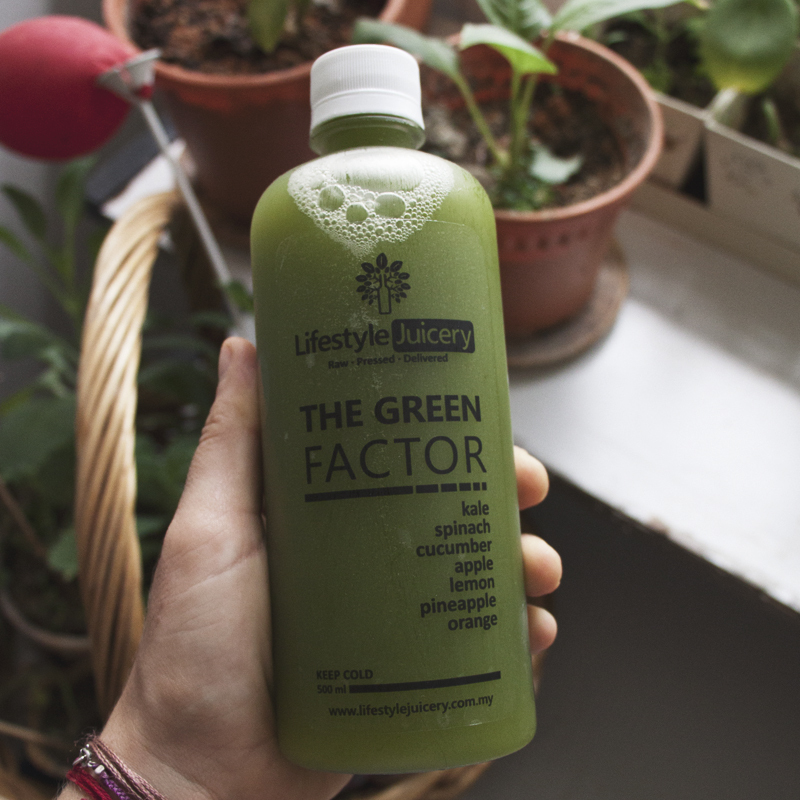 I decided to give one a try anyway with the help of the good people at Lifestyle Juicery in Kuala Lumpur. 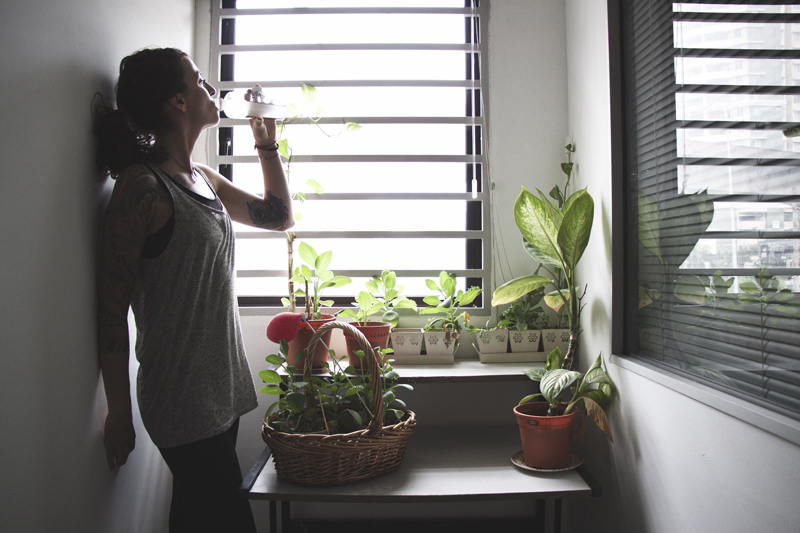 Feel like doing your own juice cleanse at home but don’t know where to start? Check out these juicers reviews on Janes Kitchen Miracles. T-2 days, and I receive pre-cleanse instructions by email to cut down on caffeine, sugar, salt and other things that I don’t consume anyway, and to stay hydrated. I’m excited! The night before the cleanse, a humongous box is delivered right to my hotel door. 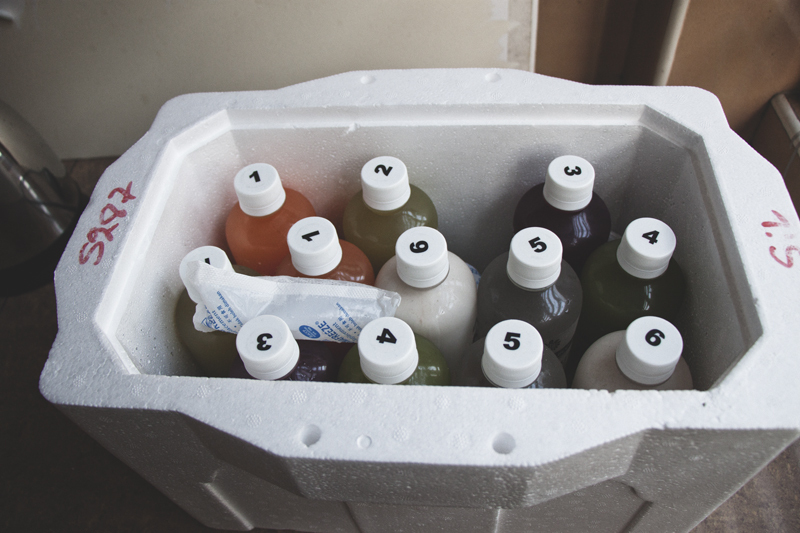 I open it swiftly to discover 12 x 500ml bottles of beautiful, raw, cold-pressed, organic juice in a cooler with a few icepacks and a portable insulated cooler bag. I wake up hungry with a headache from the extreme air conditioning in my dorm and feeling tired from a bad night of sleep courtesy my snoring bunkmate. 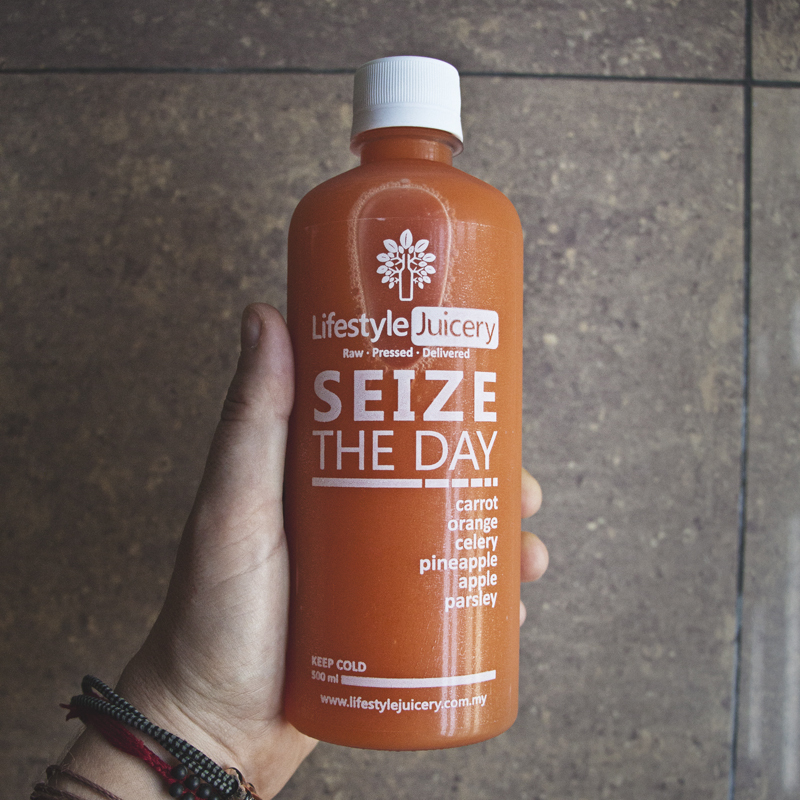 I make myself a mug of hot lemon water at 8am and, at 9am, crack open the first bottle called “Seize The Day”, a yummy blend of carrot, orange, celery, pineapple, apple and parsley. I chug it down rather quickly (cavewoman hungry!) It does satiate me for a while, but an hour later, I’m feeling hungry again. I sense a challenge here. I just watch the minutes tick by until 11am as I am trying to space the bottles apart every 2 hours to have something to drink until 7pm. At last, 11am comes and “Mean Green”, a mix of kale, spinach, cucumber, apple, lemon, broccoli and ginger is fast consumed. I like this – it tastes just like any green juice I would make for myself back home. The air, however, smells of toasting bread, roasting garlic and durian from the open window and I’m already craving solid food. I am starving again by 1pm. “Root for red” is a mix of kale, carrot, apple and broccoli that tastes very green also, a little like the previous one. I like this too. I have decided to take it easy today and not do much – it’s a good thing because I am feeling tired and irritable. At 2:30, I make myself a cup of hot lemon water. This helps at curbing my appetite a little. I feel like I’m just peeing all the time. Someone told me on Facebook that I should sip the juice slowly and “chew” it instead of chugging it. Chewing juice…? Right. It’s finally juice o’clock! The hot lemon water is helping a lot and my headache seems to be subsiding a little. “The Green Factor” is another kale number that contains also spinach, cucumber, apple, lemon, pineapple and orange. Love the touch of pineapple in there. So, chewing and slow sipping it is. This seems to satiate me better in fact. This “chewing the juice” thing actually makes sense: the chewing (which is more like swishing around) allows the temperature of the juice to match you body’s own, making it easier to digest and assimilate. Apart from this, I realize it actually makes sense to drink these lovely fresh juices slowly and with a more mindful attitude than I have been. I regret absentmindedly chugging down 3 of them out of hunger. I think this cleanse is a great exercise in mindfulness for me, which I unfortunately don’t always have when it comes to feeding myself. Knowing this, I make the best effort to be present with the consumption of my 5 o’clock “Coconut Groove”, a simple but delicious coconut water with a cinnamon stick. I was starving before consuming it, but strangely satisfied afterwards. I even found some energy to do 15 minutes of yoga – even having missed my daily practice for a fifth day now. As a very active person, I’d consider adding some amino acids supplements into my next cleanse. Check out these reviews from The Fit Bay if you don’t know where to start! 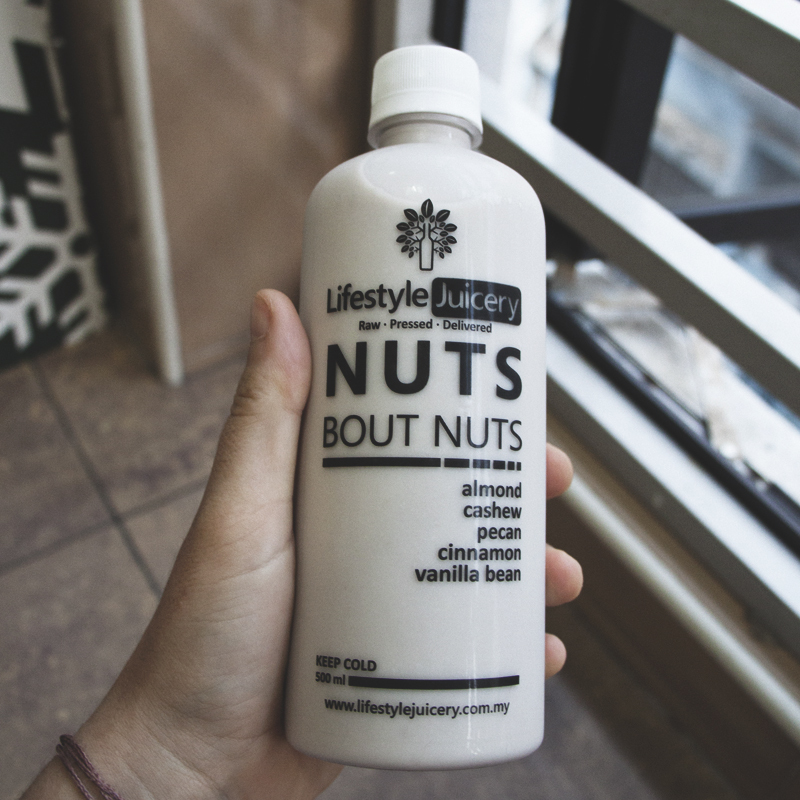 By the time 7pm comes, I am feeling the best I have so far and slowly sip on the delicious “Nuts Bout Nut”, a creamy almond, cashew and pecan milk with cinnamon and vanilla that feels like a real treat. One last mug of hot water at 9pm and I am off to a long, dreamless night of sleep. Woke up at 5:30 thanks to snoring bunkmate. Despite that, I feel great. I lie around in bed a while, sit up, and meditate for 20 minutes. I slip out of bed by 7:30 and nurse a mug of hot lemon water. I find it easy to wait until 9am to drink my first juice, which I slowly “chew”. Lifestyle Juicery sends me a text to ask how I am getting on, which is such a nice personal touch. Erina recommends I put some chia seeds in my drinks if I am too hungry – great idea! She also tells me that I can switch around the order of my juices to have the coconut water after my 3pm Pilates trial class. I’m feeling quite well looked after. Today goes by much better than yesterday; the juices satiate me completely if I sip on them mindfully. 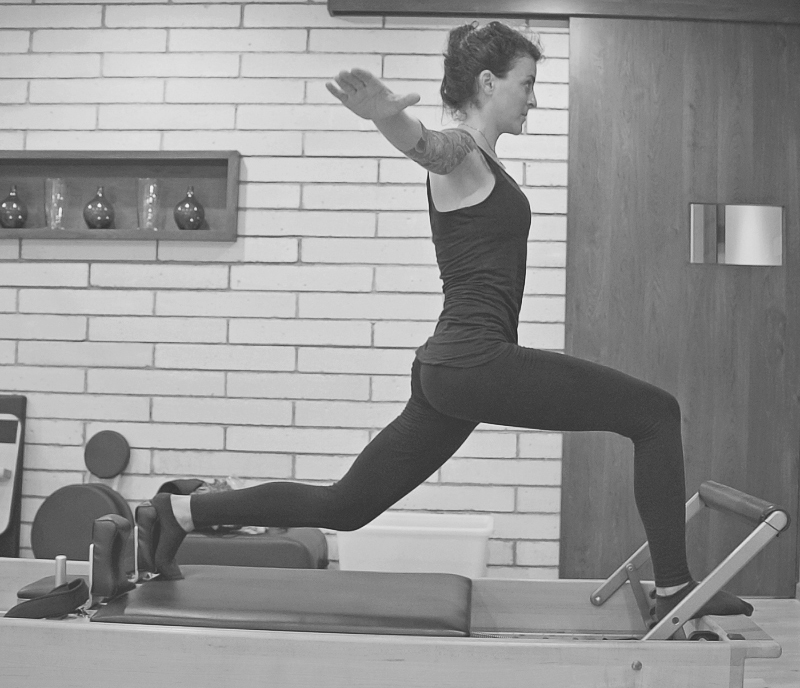 At 2:45, I show up at Urban Spring Wellness and Pilates for my complimentary 30 min Pilates class and I am no longer feeling weak or fuzzy. However, the class is rather difficult and my legs and abs are burning by the time the 30 minutes are over! I’m glad I brought my coconut water on the recommendation of Erina as I am a sweaty mess. 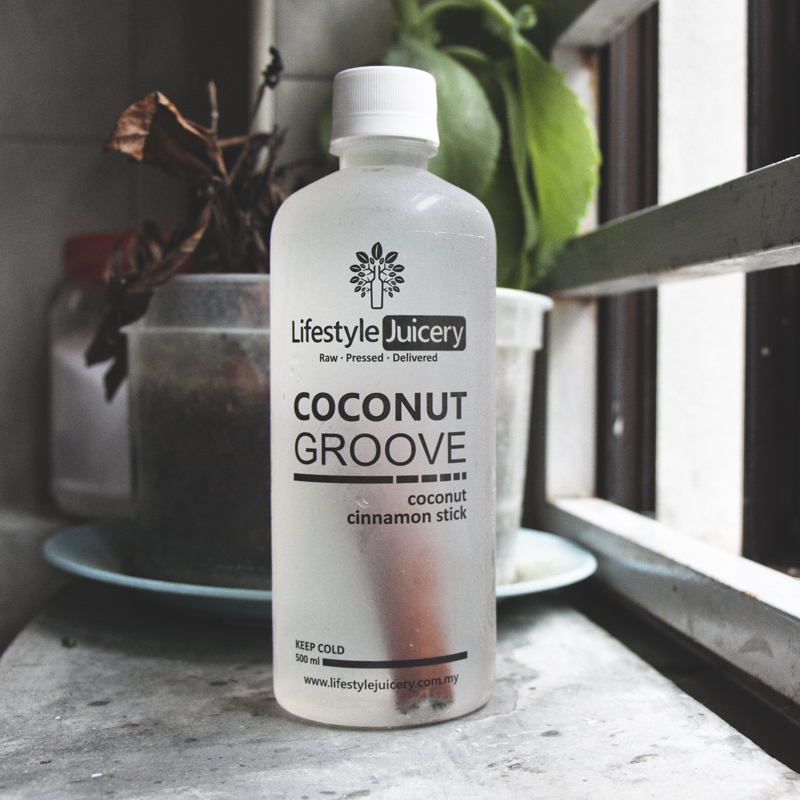 If you’re doing your own cleanse at home, these recovery drinks over at RunnerClick would make good alternatives to the coconut water. Today I have another challenge as some friends asked me if I would like to join them at a restaurant. I do warn them about the cleanse and pack my last bottle of “Nuts Bout Nuts” as I make my way there. Surprisingly, it’s not so difficult. The food does look good, but my vanilla cinnamon nut milk tastes amazing and I sip away as we enjoy a nice chat over dinner. I’m feeling great by now! One last warm mug of water before going to bed at around 10pm. I wake up feeling rested the next day and walk to the market to pick something for breakfast. I settle on a quarter of a beautiful watermelon that I carry back to my guesthouse, swaggering like a child with a bagful of 7/11 junk. I drink my hot lemon water before digging into the melon. It is heavenly. And also very filling. I closely inspect myself in the mirror, pinching some skin rolls and poking at my face, trying to see if this 2 day program has changed me in any way. I find my skin is glowing and I am feeling strangely rested despite the poor sleep I’ve had these past few days. But most importantly, I feel happy for developing a more mindful attitude in the way I feed myself. I think this juice cleanse was just what I needed to reach towards a new level in my spiritual journey and I am so grateful for the opportunity. 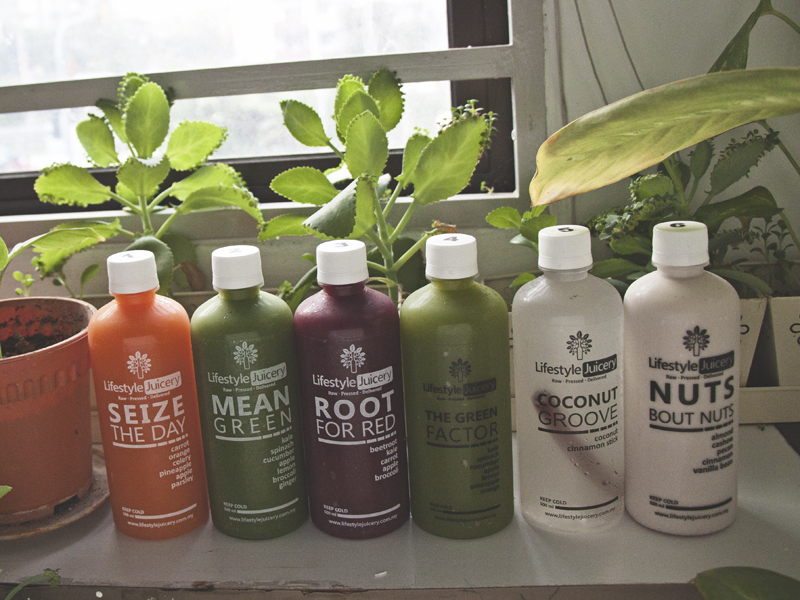 Heartfelt thanks to Lifestyle Juicery for providing me with a 2-day juice cleanse. Rest assured that you receive my honest opinion regardless of who is footing the bill. This entry was posted in Asia, Healthy Living, Malaysia on August 9, 2015 by Amélie. I’ve been interested in doing a juice cleanse for awhile now but I seem to chicken out! These ones looks good especially Nuts about nuts! Yes it was my favorite! It was good because the bottles were quite big, so if I took my time drinking them mindfully, I felt completely satiated after. 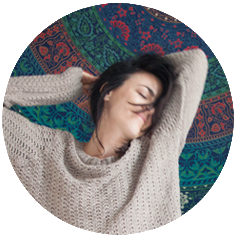 This looks like a great way to cleanse. I have to cleanse my liver and kidneys often thanks to autoimmune disease, and this looks like a much more satiating way to do it! Thanks for the feedback. Great way to stay healthy! Thanks for the motivation! I have been contemplating about this juice cleanse but I always “fail” in my attempts. I like that this one has different flavors and it looks good. Glad you liked it and it worked for you. I tried one last year and can still taste the hideousness of the vegetable ones! Love the sound of the one with cinnamon/vanilla, but would like it with food I think!! What a great idea to buy bottles of juice. I can image it’s a lot easier while traveling! Nice recap of your experience–not sure it’s for me, though. Well done! The cleanse sounds great and the combination of the juices sound pretty delicious! It would have been difficult for me to sit in a restaurant and watch others eat though! Good for you! I could never do this. I just like food, too much. My husband did one. He rated it as a positive experience but he was grumpy and moody for much of Day 2. I think I’d try the raw cleanse, where you can eat as many fresh fruits and veggies as you want as long as they are raw for 3 days.